It’s taco night!! 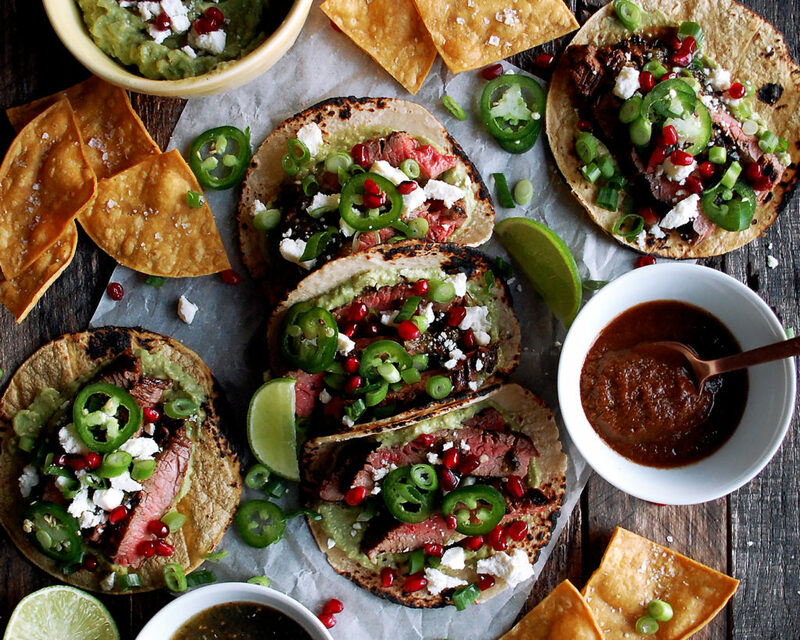 And these Citrus Marinated Steak Tacos are going to be your new all-time favorite! I cannot explain how unbelievably good these tacos are. 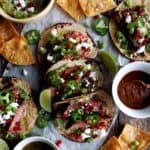 I’ve been loving Gaby Dalkin’s (from What’s Gaby Cooking) salsa line from Williams Sonoma so much that I couldn’t wait to create a beautiful recipe using ALL three products. I first mixed the tomatillo salsa into a really tangy citrus marinade that has orange, lemon, and lime juice. The flank steak gets covered in this mixture and chilled for about an hour…and the result? AMAZING. The steak is so flavorful and fragrant once it’s cooked. I just love it. I then of course needed to make some homemade tortilla chips and guacamole. The guacamole starter from Gaby basically does all the work for you when it comes to flavor. All I did was stir it in with some beautifully ripe avocados and it was ready to go. With a good measure of salt, of course. And from there it was assembly time! I finished off the tacos with some charred corn tortillas, a little extra salsa (the chipotle tomato salsa being my favorite of the line), some queso fresco, jalapeno, pomegranate seeds, and always a squeeze of lime to finish. This was an absolutely amazing meal, and such a fun one, too. I mean…it’s tacos. You cannot go wrong! PS. I’m hosting a giveaway for these What’s Gaby Cooking products on my Instagram!! One winner will get both salsas and the guacamole starter. And trust me, you NEED them. Head on over to @theoriginaldish to enter! Place the flank steak in a plastic zip-lock bag. In a mixing bowl, whisk together the pomegranate juice, brown sugar, tomatillo salsa, orange juice, lemon juice, lime juice, safflower oil, salt, and black pepper. Pour the marinade into the bag and tightly seal so that the steak is fully coated. Place the steak in the refrigerator and let marinate for 1 hour. Meanwhile, cut the corn tortillas into quarters. Add enough oil to a large saute pan to come up the sides about ¼ of an inch. Heat the oil over medium heat. When the oil reaches 350-375F, start to fry the tortillas, working in batches so you don’t overcrowd the pan. Fry each tortilla for a few minutes until golden and crispy. 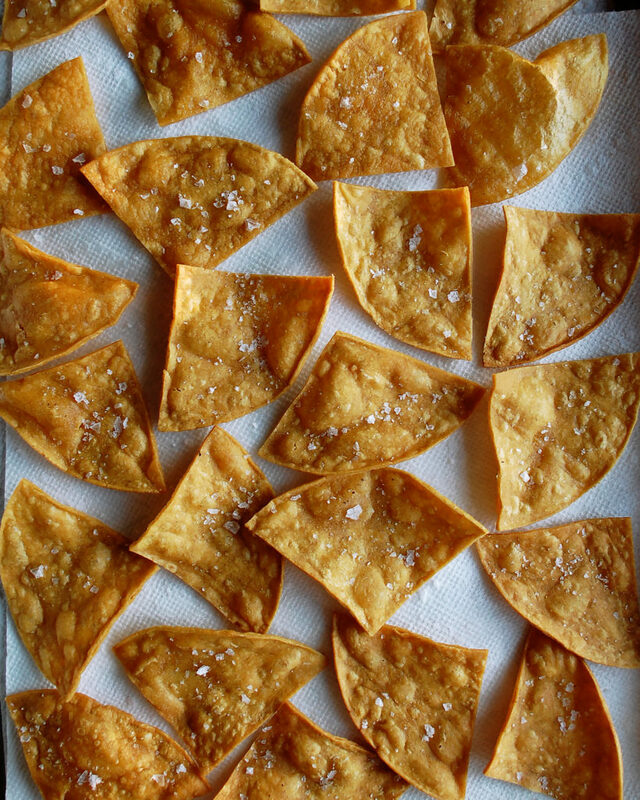 Transfer the chips to a paper towel lined plate and immediately sprinkle with a pinch of flaky sea salt. Repeat until all of the tortillas are fried. Mash the avocados in a bowl using a large fork. Stir in the guacamole starter and lime juice. Season with salt to taste. Preheat the grill or heat a grill pan over high heat. Oil the grill or grill pan. When hot, drain the steak from the marinade and place it onto the grill. Let sear on one side for about 4 minutes. Flip the flank steak and sear for another few minutes. Lower the heat and let the steak continue to cook until your desired temperature. Transfer the steak to a cutting board and lightly tent with a piece of foil. Let rest for 15 minutes. Thinly slice the steak on a bias against the grain. Char the corn tortillas on the grill (or if it’s winter, I like to just place them right over the stovetop burner). Transfer the tortillas to a plate and cover to keep warm. 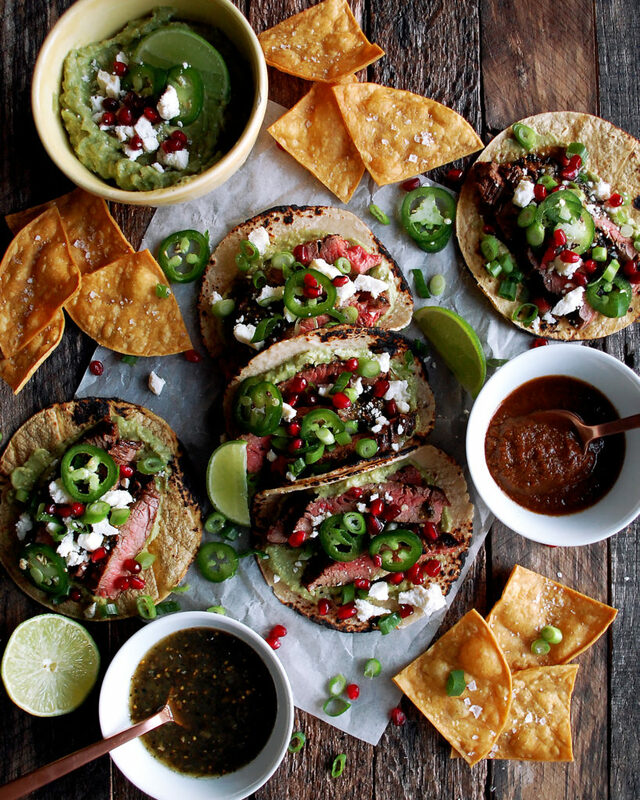 To assemble the tacos, spread a little guacamole onto each tortilla. 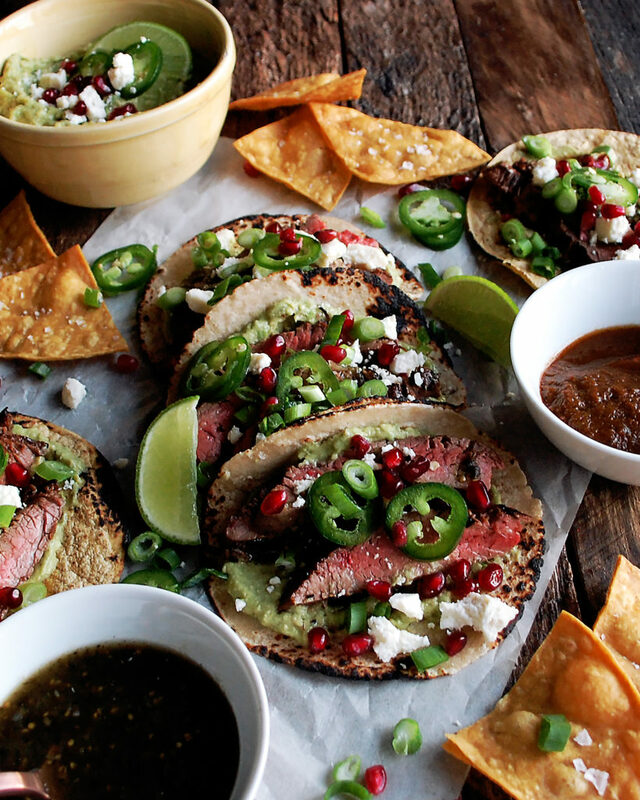 Place a few slices of steak on next, then a spoonful of salsa, a handful of queso fresco, a few jalapeno slices, some pomegranate seeds, and a squeeze of lime. Serve with the tortilla chips and more guacamole.